When lymph nodes are removed or damaged during breast cancer treatment, it can cause a condition known as lymphedema that results in painful swelling of the limbs. It’s estimated that up to 53 percent of women with breast cancer will eventually develop lymphedema. Call Congressional leadership today and urge them to pass the Lymphedema Treatment Act! Currently, Medicare and many private insurance policies fail to cover the costs of the daily compression supplies people with lymphedema need to control their swelling. People who can’t afford these supplies go untreated, which can lead to infections and long-term disability. The Lymphedema Treatment Act would end this injustice by changing Medicare law to cover compression supplies—setting an important precedent for Medicaid and other insurers to do the same. 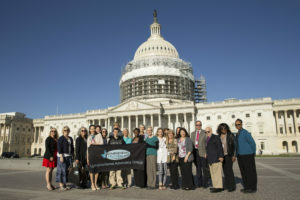 Urge Congress to pass the Lymphedema Treatment Act! Thanks to our partners at the Lymphedema Advocacy Group and activists like you, we’re making huge progress towards getting this bill passed. The Lymphedema Treatment Act is now the most supported healthcare bill in Congress with over 340 cosponsors. The next step is getting the bill passed! This is a milestone moment and we need your help to push this important bill forward. Call Congressional leadership today and ask them to bring this bill to a vote. All women deserve access to comprehensive lymphedema treatment. Make sure these legislators know you care about equal access to lymphedema treatment. It’s time Congress did something good for women’s health. P.S. Support Breast Cancer Action’s role as an independent watchdog by making your year-end donation today. Thanks to our grassroots members, you can always count on us to put women’s health before corporate profits because we will never take funding from any company that profits from or contributes to breast cancer.